In what we can only describe as the pinnacle of independent watchmaking, Greubel Forsey once again takes the center stage at Baselworld 2018. Highlighting their expertise in 'black polishing', the brand released four new watches that capitalize on the art of 'black polishing'. One of these four watches is the new Greubel Forsey Quadruple Tourbillon Blue available in platinum or 5N red gold. In an analogy with the sunset's 'green flash', the extremely rare optical phenomenon that occurs on the horizon of an ocean or a lake at sunset and where just for an instant, one last flash of green light appears on the horizon; the 'green flash' is the last beam of sunlight before night falls and turns the sky black. Immersing you in its world through light and its expression in colors, Robert Greubel and Stephen Forsey see their 'black polishing' as the 'green flash' of horology Called 'black polishing' because highly polished surfaces become so flawlessly shiny that depending on lighting conditions and shadows, light is no longer reflected and these surfaces tend to appear black at times —just pay attention to our images taken from different angles. Endowed with a power reserve of 50 hours, the power reserve indicator with running seconds at 2 o'clock takes a prominent role within the splendor of this dial. 'Black Polishing' expresses Greubel Forsey’s applied art in decorating and hand-finishing its creations. This masterful polishing enhances a timepiece’s architecture and components to make it incredibly expressive. It takes enormous talent, years of practice, almost infinite patience and tremendous know-how to achieve this true feat of human and technical prowess. As they constantly push beyond accepted boundaries, Robert Greubel and Stephen Forsey tirelessly continue their search for perfection in watchmaking excellence. A timepiece reveals a black polished surface when direct light is no longer reflected and it suddenly turns to a deep jet black with no reflection, the intensity and profound absence of luminosity catching the eye of the observer. This is particularly evident in how Greubel Forsey’s hand polishing is pursued until the perfect result of an incredibly deep jet black polish without reflection is achieved. This performance is made all the more remarkable and exceptional as it is applied to all the different materials —steel, gold, platinum, titanium, etc.— and all sizes of surfaces from screws to hands, and from bridges to dial plates amongst other components. The new Greubel Forsey Quadruple Tourbillon Blue is a perfect example of this polishing art with its blue black polished dial. Technically, the four tourbillons offer a spectacle of astonishing elegance as they perform an ethereal, perfectly choreographed ballet. Each connected to a spherical differential, they contribute independently to obtaining a precise and reliable timing rate, especially in stable positions. The spherical differential transmits the average timing rate of the four tourbillons, thus improving the chronometric performance of all the regulating organs. In view of the impressive number of individual elements making up the movement, the case has been sculpted with asymmetrical forms. An asymmetry that forms an aesthetic reflection of the asynchronous dynamic of the four tourbillons. has on this occasion been applied to an unusually large surface, covering the entire surface of the dial. When reflecting direct light we see a blue of a depth seemingly never before attained. 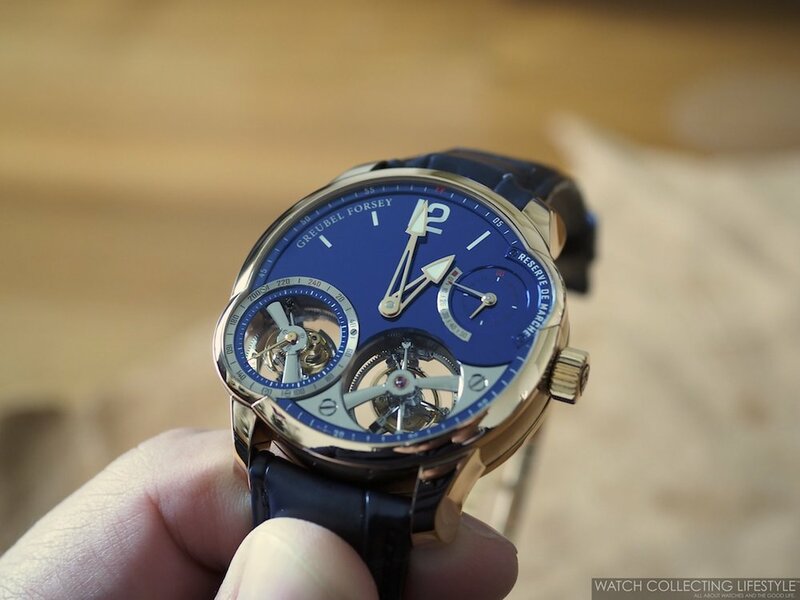 Turning the Greubel Forsey Quadruple Tourbillon Blue over reveals more intricate and incredible work on the movement. The movement is composed of 534 parts with four tourbillon cages composed of 261 parts and a total weight of 2.26 grams. This 63-jewel manual wound movement features olived-domed jewels in gold chatons. Additionally, the brand presents a rare view of the barrel-polished tourbillon cage, showing this minuscule piece as a paragon of meticulous work with no hint of even the slightest imperfection. Two series-coupled fast rotating barrels —1 turn in 3.2 hours— guarantee an autonomy of 50 hours while beating at a frequency of 21,600 vph. On the wrist, it is almost impossible to find words that describe the feeling of having such incredible piece of horology on. The Greubel Forsey Quadruple Tourbillon Blue wears true to its actual size of 43.5 mm in diameter and 16.11 mm in thickness. This new watch by Greubel Forsey is an incredible piece of horology in all the sense of the word. Once you've reached these heights, it is very hard to make things any better. A perfect example of the pinnacle of independent watchmaking. The Greubel Forsey Quadruple Tourbillon Blue is available in a limited edition of 8 pieces in platinum and 8 pieces in 5N red gold. Sticker Price CHF 704,000 Swiss Francs for 5N Red Gold and CHF 724,000 Swiss Francs for platinum —approximately $735,000 USD and $755,000 USD respectively. 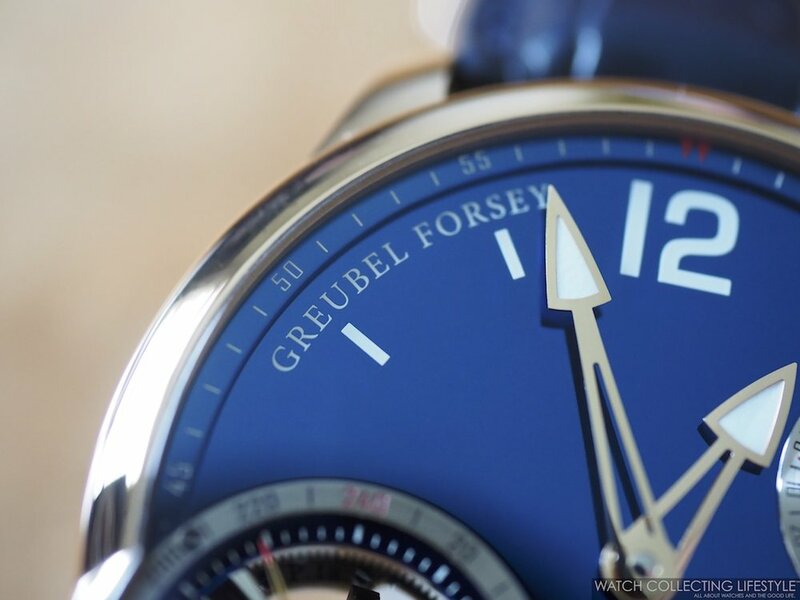 For more info on Greubel Forsey click here. Posted on April 6, 2018 by Editor & Publisher and filed under Baselworld 2018, Baselworld, Greubel Forsey and tagged Greubel Forsey Baselworld Baselworld 2018 Greubel Forsey Quadruple Tourbillon Blue Tourbillons Independent Brands Independents 2018 Most Popular.